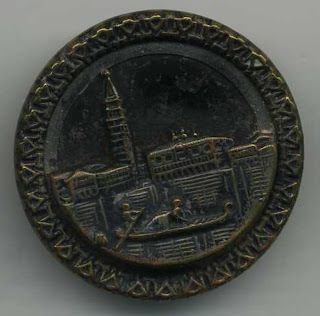 This and other fabulous buttons available at www.thebuttonmonger.com. Grand Canal Venice with the Doge's Place and St. Marks in the background. Tinted brass over a blackened metal background, narrow underliner at rim. Steel back and wire shank. 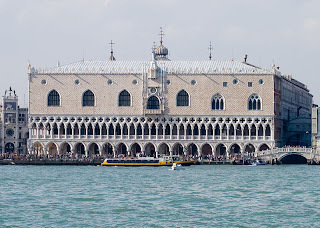 The Doge's Palace (Italian: Palazzo Ducale) is a palace built in Venetian Gothic style, and one of the main landmarks of the city of Venice, northern Italy. The palace was the residence of the Doge of Venice, the supreme authority of the Republic of Venice, opening as a museum in 1923. Today it is one of the 11 museums run by the Fondazione Musei Civici di Venezia. St Mark's Campanile (Campanile di San Marco in Italian) is the bell tower of St Mark's Basilica in Venice, Italy, located in the Piazza San Marco. It is one of the most recognizable symbols of the city. 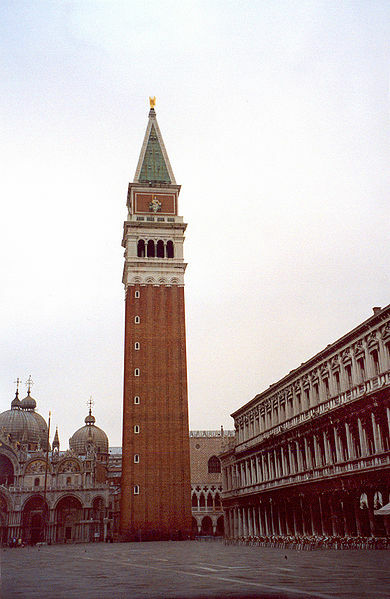 The tower is 98.6 metres (323 ft) tall, and stands alone in a corner of St Mark's Square, near the front of the basilica. It has a simple form, the bulk of which is a fluted brick square shaft, 12 metres (39 ft) wide on each side and 50 metres (160 ft) tall, above which is a loggia surrounding the belfry, housing five bells. The belfry is topped by a cube, alternate faces of which show the Lion of St. Mark and the female representation of Venice (la Giustizia: Justice). The tower is capped by a pyramidal spire, at the top of which sits a golden weathervane in the form of the archangel Gabriel. The campanile reached its present form in 1514. The current tower was reconstructed in its present form in 1912 after the collapse of 1902.